If you haven’t cast your vote yet for your favorite new web-based school meal programs application, there’s still time. The polls will remain open until 5pm ET on March 25. Spread the word and tell your friends & family to vote for you! It’s your turn to pick the winner! Anyone can vote on the design they like best for the popular choice award, so browse the submission gallery and vote for your favorite. Be sure to spread the word through your social networks, too! The last day to vote is March 25. Just a final shout-out that you have two days remaining in the E.A.T. School Lunch UX Challenge. Submissions are due March 1 before 5pm ET. Find out what time that is in your city. Our submission form instruction video can guide you through how to submit a project to the hackathon. Whew, it’s the home stretch! There’s only one week left to submit your web-based application to the E.A.T. School Lunch UX Challenge. Submissions are due March 1 before 5pm ET. Find out what time that is in your city. Never submitted a project on Devpost before? 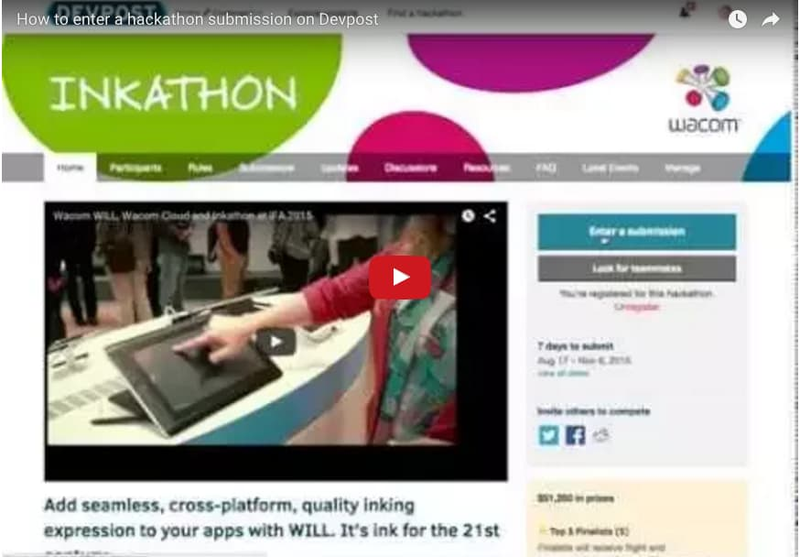 Take a look at our step-by-step instructions on how to use the hackathon submission form. Did you miss the final webinar? If you missed our final webinar, have no fear. We recorded it for you and you can watch it here. The first 15 minutes address the requirements, what to submit, and demo how to submit. Got some lingering questions about your school lunch program application UX makeover? Come to online office hours today at 3pm and hit us up for answers. Don't have time to drop in to the webinar? Not to worry. You can post your question on the Slack channel, post on the discussion forum, or email support@devpost.com and we'll respond as soon as we can. We'll also make a recording of the webinar available afterwards for your reference. Hi UX innovators! We'll be holding our final online office hours this Monday, 2/22, from 3-4pm ET. This will be an open forum for you to ask questions about anything we haven't covered yet — or to review things we have. You may also want to take a look at the summaries of the first and second webinars, in case you missed those. There are two weeks left to build a web application that completely revamps the USDA Food and Nutrition Service’s school meal programs application form! Submissions are due March 1 before 5pm ET. Find out what time that is in your city. If you haven't started a submission yet, please do so now. And if you've just recently joined the hackathon, explore the quick-start guide and draw some inspiration from the competition resources. If you haven't submitted a project on Devpost before, you should also check out our step-by-step guide on how to use the hackathon submission form. There are three weeks left in the E.A.T. School Lunch UX Challenge! Beat the deadline rush by getting your submission ready early. Submissions are due March 1 before 5pm ET. Find out what time that is in your city. Also, if you missed last week's Q&A, you can check out the recording and a summary of the questions we answered right here. There’s one month remaining in the E.A.T. School Lunch UX Challenge! Submissions are due March 1 before 5pm ET. Starting a submission is a good way to make sure that your solution meets the requirements. There’s nothing worse than getting to the deadline, only to realize that you’re missing a key component. Remember: Once you submit a project, you can keep editing it as needed at any time prior to the submission deadline. Happy weekend, design & development crew! If you missed our first online Q&A with the USDA's Food and Nutrition Service, not to worry — you'll have another opportunity to ask questions during our second Q&A session on Monday, 2/1, from 1-2pm ET. If you haven't emerged from Snowmageddon 2016 yet, here's a reason to get your boots on: We're holding our second virtual office hours on Monday, February 1, from 1-2pm ET. Bring your questions, your concerns, your ideas, and your quandaries. Just don't bring more snow. Missed our first Q&A? You can read through all the questions and answers here. RSVP for the 2/1/16 Q&A. We know you’re focused on your school meal application’s UX and information design right now, but don't forget about your submission video. It's often the first (and sometimes only) thing that judges and voters review. Over the past few weeks, we've received quite a few questions about the required information for households participating in assistance programs, or households that include foster, homeless, migrant, runaway, or Head Start students. We understand that these are complex scenarios, and so have created this Household Scenario Matrix to help you understand what required fields can be skipped based on the household or student statuses. We'll be talking more about these scenarios and reviewing the matrix during today's webinar at 1pm ET. Just a quick reminder that we'll be holding open online office hours with the USDA's Food and Nutrition Service this Thursday, 1/14, from 1-2pm ET. Come with questions, points that need clarification, or an idea you'd like to share. You may also want to review some common participant questions on our FAQ page beforehand. Over the last two weeks we’ve received some great questions from participants about the form requirements for the E.A.T. School Lunch UX Challenge. Since others may be wondering the same things, we wanted to share these questions and answers with all of you! To check out the Q&A’s, visit the competition’s FAQ page and review the Participant Questions section. Not seeing an answer to a question you have? You can ask it by posting on the discussion board, emailing support@devpot.com, or joining our live Q&A webinar on January 14th from 1-2pm ET (RSVP here!). We’ll be holding online office hours next week to answer your questions about the competition and explain more about what the USDA Food and Nutrition Service’s goals and expectations are. We’ve fielded some questions this week about the existing background research and user testing for the National School Lunch Program electronic application. Instead of answering these questions individually, we thought we’d address them all at once in the Q&A below. Have user interviews and user testing already been completed for the school meals program electronic application form? Thank you for your interest in the E.A.T. School Lunch UX Challenge! Welcome to the second week of the E.A.T. School Lunch UX Challenge! Thank you for your interest in improving the school meal programs application process for millions of U.S. families. By now you’ve probably watched the video and read through the competition resources. At some point you’re likely to have questions. Please don’t hesitate to ask for help or clarification. Our goal is to make this as rewarding for you as it is for us. Thanks for joining the E.A.T. School Lunch UX Challenge! You're officially registered now, and we’ll be sending you regular updates throughout the competition. Here’s how to get started on your project today. Submissions are due March 1, 2016, at 5pm ET. Plan your attack. Visit the resources page for required form fields and statements, a question logic flow chart, a deeper explanation of the problem, and behavioral science and UX recommendations.